Microlensing is the only known method capable of discovering planets at truly great distances from the Earth. Whereas radial velocity searches look for planets in our immediate galactic neighborhood, up to 100 light years from Earth, and transit photometry can potentially detect planets at a distance of hundreds of light-years, microlensing can find planets orbiting stars near the center of the galaxy, thousands of light-years away. Microlensing is an astronomical effect predicted by Einstein's General Theory of Relativity. According to Einstein, when the light emanating from a star passes very close to another star on its way to an observer on Earth, the gravity of the intermediary star will slightly bend the light rays from the source star, causing the two stars to appear farther apart than they normally would. This effect was used by Sir Arthur Eddington in 1919 to provide the first empirical evidence for General Relativity. Now, if the source star is positioned not just close to the intermediary star when seen from Earth, but precisely behind it, this effect is multiplied. Light rays from the source star pass on all sides of the intermediary, or "lensing" star, creating what is known as an "Einstein ring." Even the most powerful Earth-bound telescope cannot resolve the separate images of the source star and the lensing star between them, seeing instead a single giant disk of light, known as the "Einstein disk," where a star had previously been. The resulting effect is a sudden dramatic increase in the brightness of the lensing star, by as much as 1,000 times. This typically lasts for a few weeks or months before the source star moves out of alignment with the lensing star and the brightness subsides. While this is the normal pattern of a microlensing event, things are substantially different when the lensing star has a smaller companion. If a planet is positioned close enough to the lensing star so that it crosses one of the two light streams emanating from the source star, the planet's own gravity bends the light stream and temporarily produces a third image of the source star. When measured from Earth, this effect appears as a temporary spike of brightness, lasting several hours to several days, superimposed upon the regular pattern of the microlensing event. For planet hunters, such spikes are the telltale signs of the presence of a planet. Furthermore, the precise characteristics of the microlensing light-curve, its intensity and length, tell scientists a great deal about the planet itself. Its total mass, its orbit, and its period can all be deduced with a high degree of accuracy and probablity from the microlensing event. Microlensing is capable of finding the furthest and the smallest planets of any currently available method for detecting extrasolar planets. In January of 2006 scientists announced the discovery through microlensing of a planet of only five Earth masses, orbiting a star near the center of our galaxy, 22,000 light-years away! It was the lowest mass planet detected up to that time, and also the furthest from the Earth. Microlensing, furthermore, is most sensitive to planets that orbit in moderate to large distances from their star. This makes it complementary to the radial velocity and transit detection methods, both of which are most effective at detecting planets orbiting very close to their stars. Finally, like transit photometry, microlensing searches are massive, targeting tens of thousands of planets simultaneously. If a microlensing event takes place anywhere within the observed starfield, it will be detected. If the holy grail of the hunt for extrasolar planets is the discovery of other "Earths," then microlensing surely has an important role to play. By detecting low-mass planets at relatively large distances from their stars it brings scientists ever closer to finding an Earth-mass planet. By searching at great distances, it increases the number of potential planets that can be surveyed from Earth. The general curve shows the microlensing event peaking on July 31, 2005, and then diminishing. The disturbance around August 10 indicates the presence of a planet. Unlike planets detected by other methods, which are associated with particular stars and can be observed repeatedly, planets detected by microlensing will never be observed again. This is because microlensing events are unique and do not repeat themselves. Thanks to a microlensing event we know, for example, that the planet known as "OGLE–2005-BLG-390Lb" is a cold rocky world orbiting a small cool star near the center of the galaxy. After several years have passed and the background star has moved away, astronomers can sometimes observe the lensing star again and learn more about it. As for the alien world itself, we will probably never know anything more about it, since it will never be observed again. Another problem with microlensing is that the distance of the detected planet from the Earth is known only by rough approximation. When dealing with planets tens of thousands of light-years away, this could mean errors of thousands of light-years! Finally, microlensing is dependent on rare and random events - the passage of one star precisely in front of another, as seen from Earth. This makes the discovery of planets by this method both difficult and unpredictable. 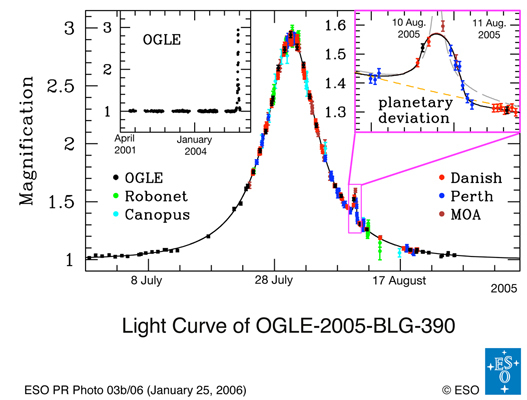 As a result, despite years of intense observations, OGLE–2005-BLG-390Lb, announced in January 2006, was only the third planet ever detected by microlensing. OGLE - the the Optical Gravitational Lensing Experiment, led by Andrzej Udalski of Warsaw University, has found the first three planets ever detected through microlensing. 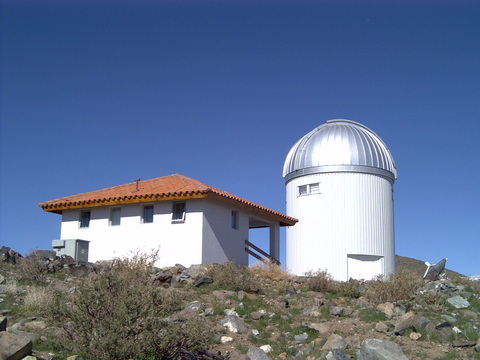 The international project makes use of the 1.3 meter "Warsaw" telescope at Las Campanas, Chile, to search for microlensing events. Every night the telescope is pointed toward the same dense field of 100 million stars in the vicinity of the galactic bulge, while the telescope's complex CCD cameras note any change in brightness of any point in the star-field. Every year OGLE detects around 500 microlensing events, but planet detections are extremely rare. Whenever OGLE detects a microlensing event, it contacts a network of telescopes that specialize in searching for signs of the presence of a planet. The networks, known as PLANET (Probing Lensing Anomalies), Robonet, and microFUN (Microlensing Follow-Up Network), include 1 and 2 meter telescopes across the globe. Participating telescopes are located at La Silla (Chile), Hobart (Tasmania, Australia), Perth (Australia), Boyden (South Africa), Sutherland (Australia), La Palma (Spain), and Haleakala (Hawaii), Auklnad (New Zealand), Pretoria (South Africa), Kitt Peak (Arizona), Mount Ida (Crete), Tahiti (French Polynesia), and Mitzpe Ramon (Israel), and other locations. 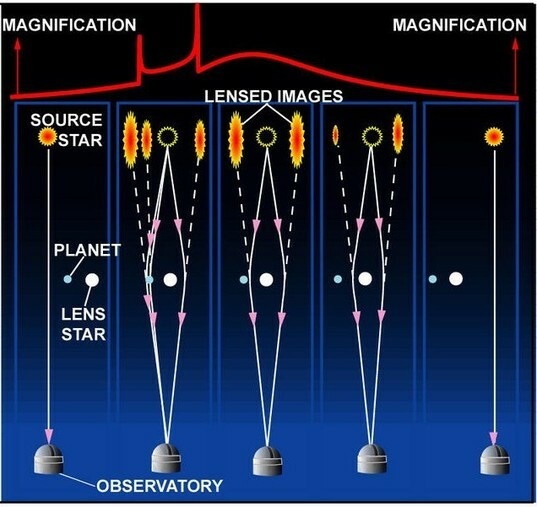 Together, the telescopes are able to continuously cover each microlensing event, providing an accurate light curve and indicating whether a planet is present or not.